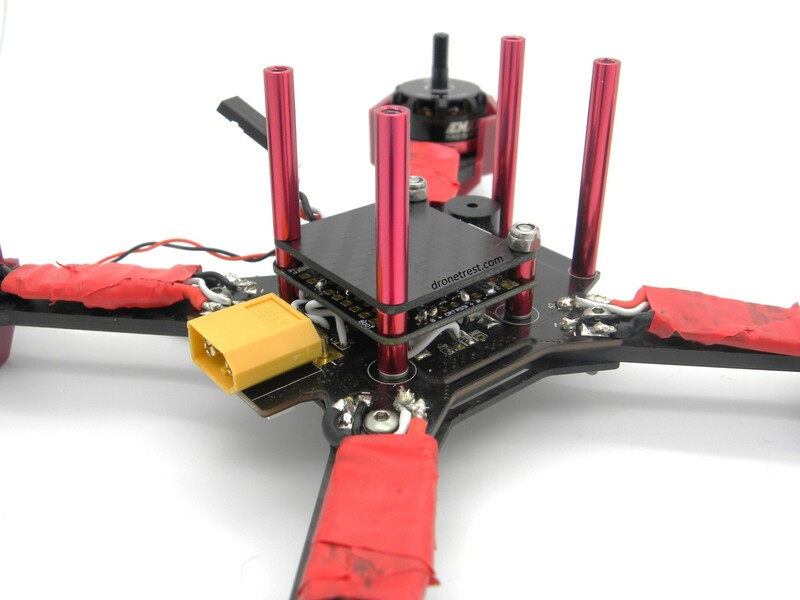 We have used the Nighthawk X5 DIY FPV Racing Quadcopter Kit in this build, the contents of which are listed below. The Emax Nighthawk X5 frame. 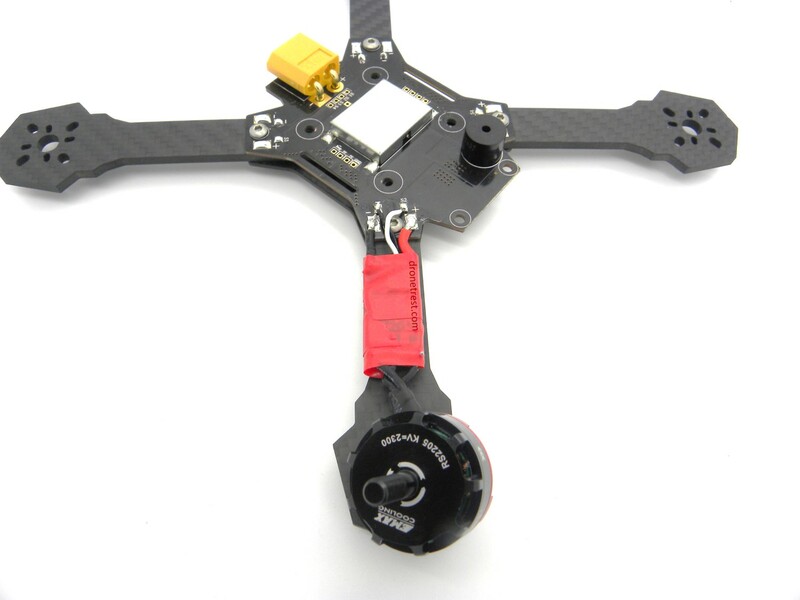 This frame looks to be a really nice frame for a FPV racer. It’s compact and all the components are contained in the centre of the frame, giving it nice balance and good reactions. 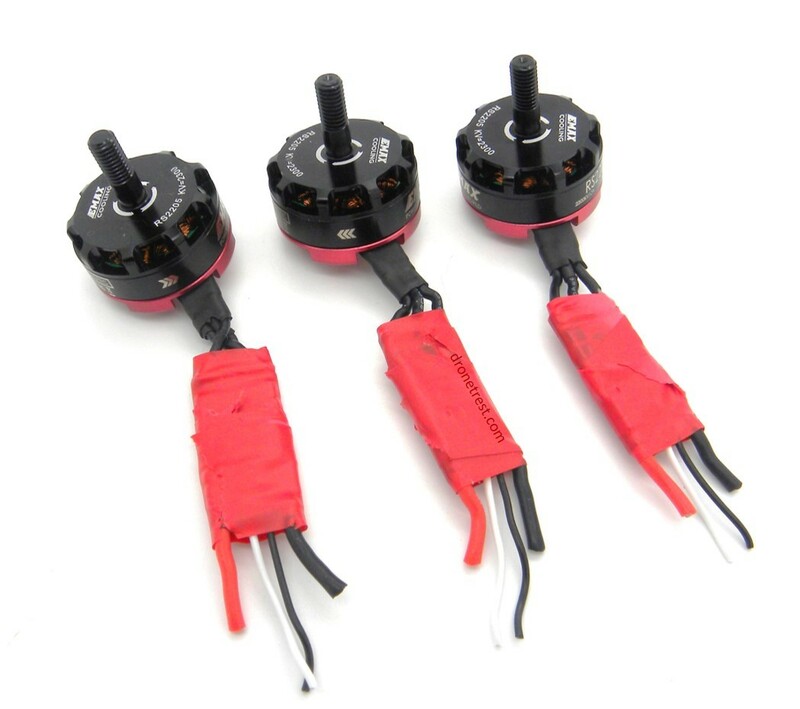 RS2205 2300Kv motors from Emax. These motors are basically the best around I think for the performance and the price. Lots of thrust to play with. 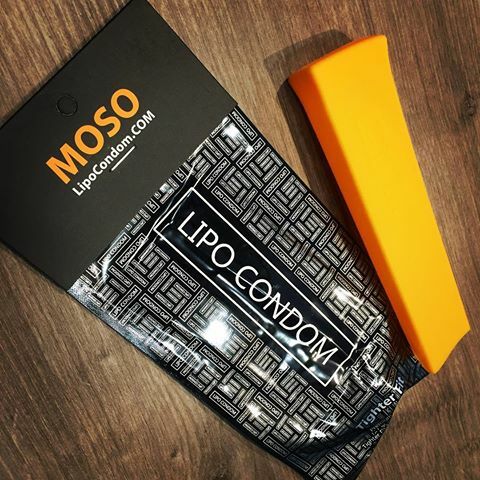 1300mah 75C 4S LiPo Battery. This is a great battery and we’re using the 75C and 4S version for more thrust and power. 4 x Cicada BLHeli_S 30A (2-4S) ESC. 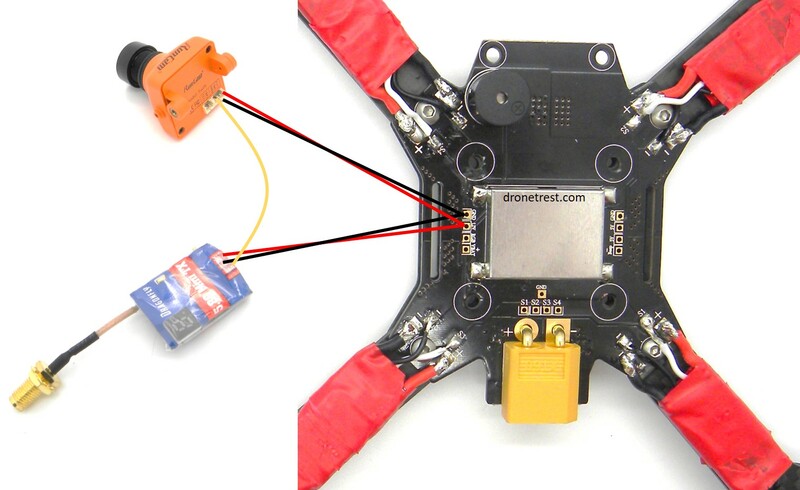 We’re using ESCs with the BLHeli_S firmware as it gives you a smoother motor response (for more details, check out the What is BLHeli_S article). 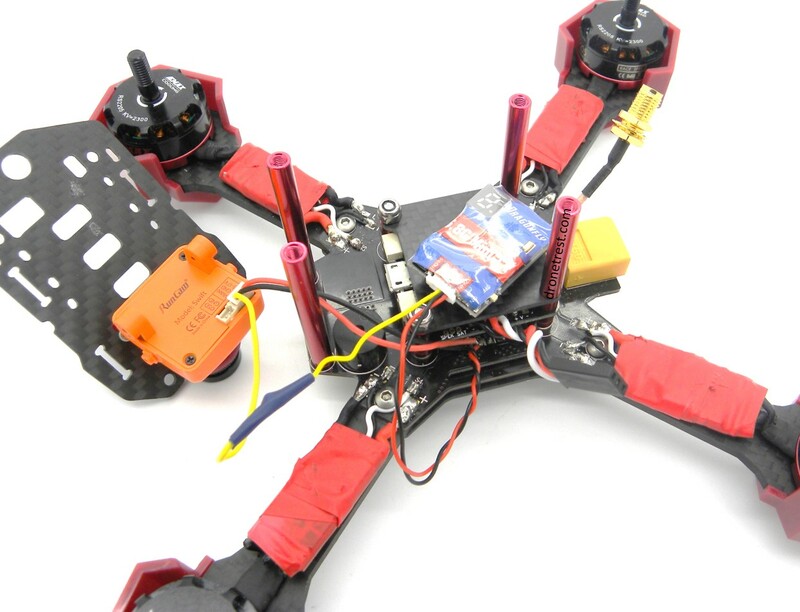 I am also going to use 30A ESCs as I am using a 4S battery (as mentioned above) and so I need this amperage. 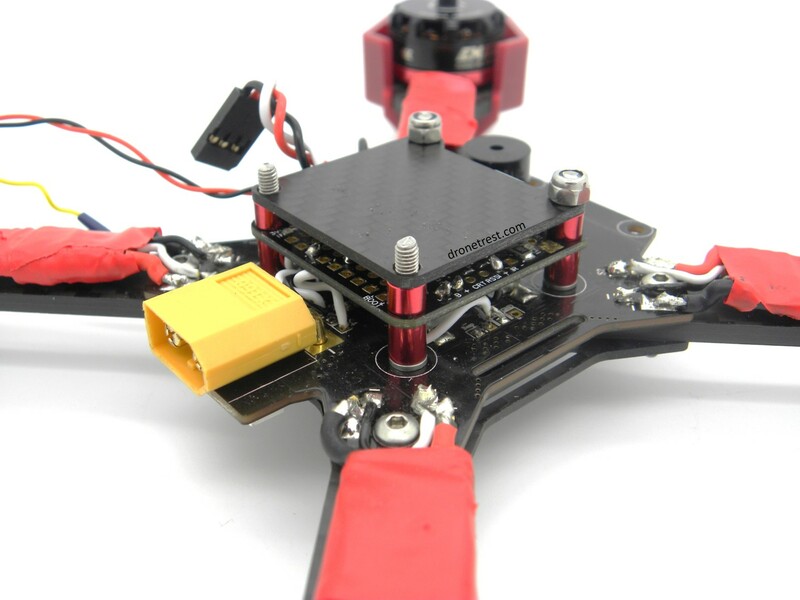 Check out the article we have on How to Choose your motor/props/ESC for more information. 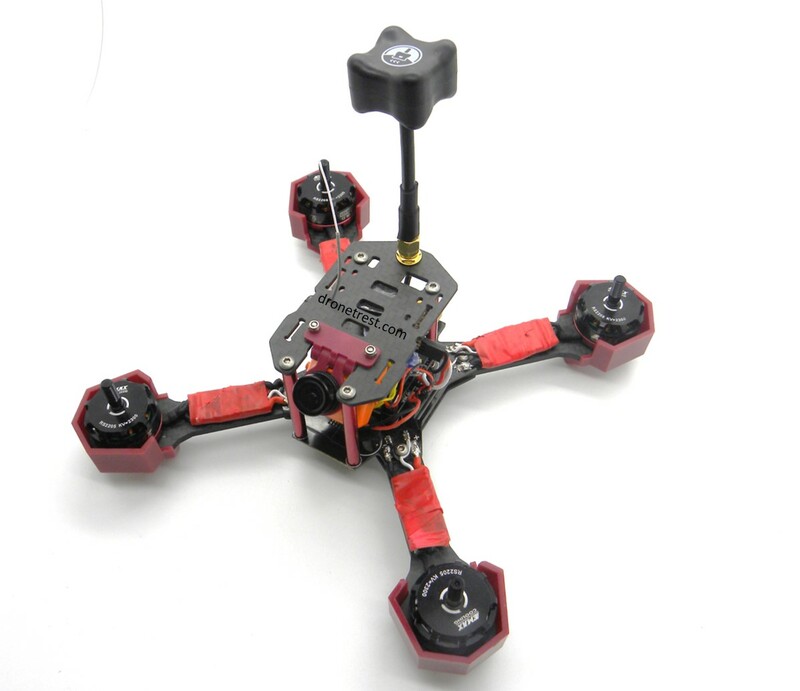 The SPRacing F3 Evo Flight Controller. 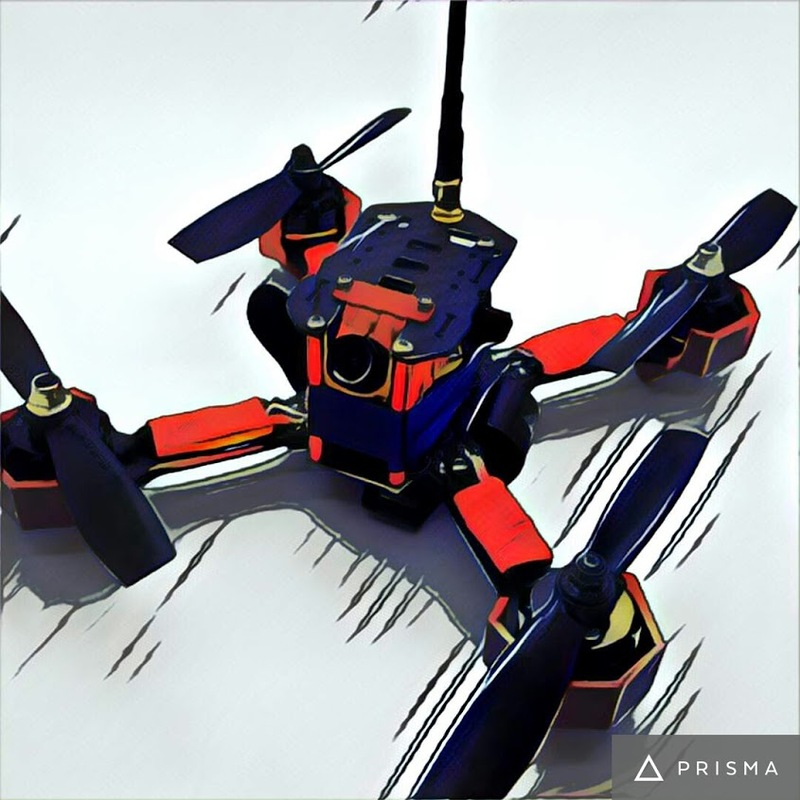 This is a great flight controller for an FPV racer drone. It’s cheap, it hosts the new generation of CPU and sensors and it was designed by the Cleanflight creator, Dominic Clifton. This flight controller also has a black box micro SD card reader along with a race timing transponder so a pretty good choice. The Radiolink AT9S Radio Transmitter and the R6DS Mini Receiver. This is a great radio. It is fairly advanced radio and has all the knobs and buttons you need. This radio comes with a receiver as default but we’re using the R6DS Mini receiver due to the limited space available on the airframe. 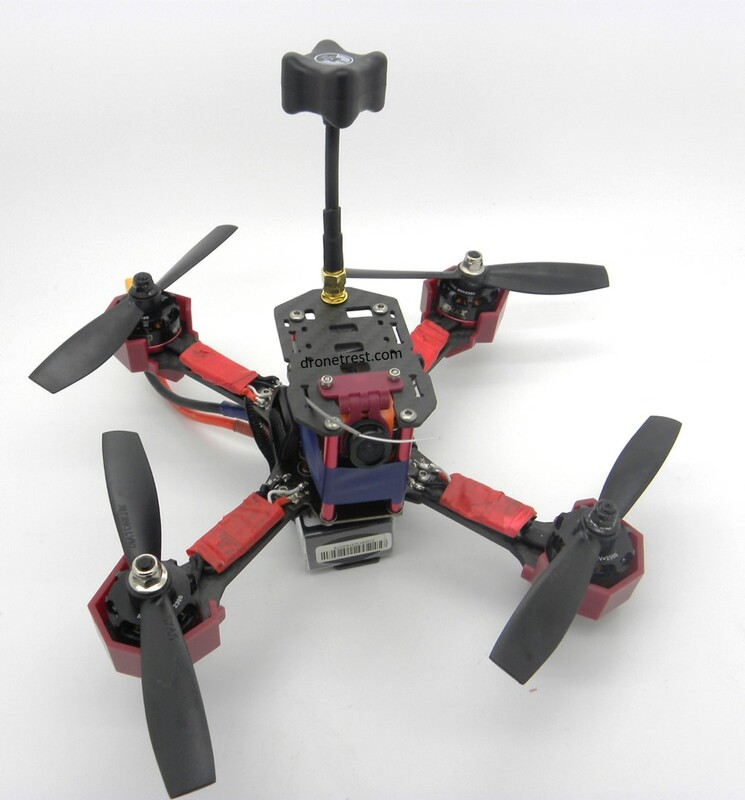 The Runcam Swift Camera and the Dragonfly 40Ch 200mW Video Transmitter. This is the FPV gear I have gone for. I think the Runcam Swift has proven itself with its popularity and quality and the Dragonfly transmitter is a useful little transmitter with some cool features. 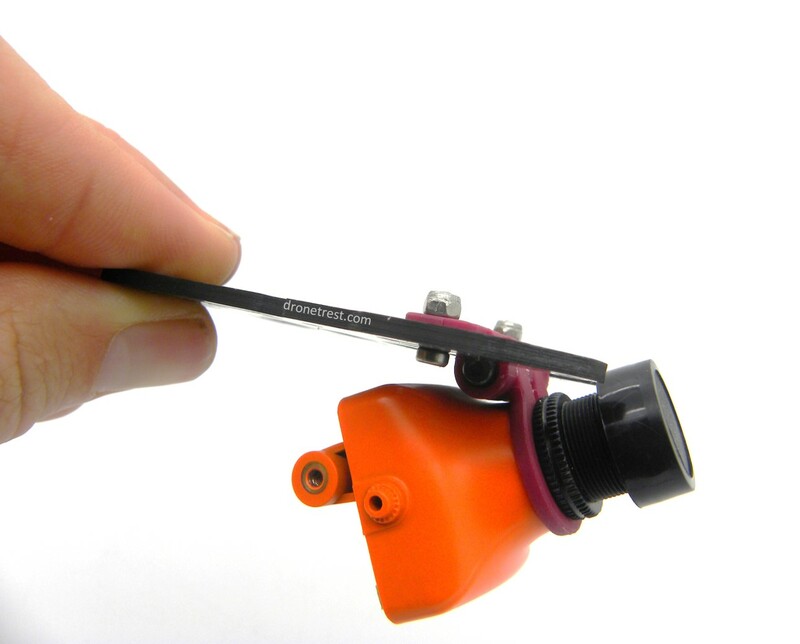 I will also use a TBS Triumph Antenna to improve the range. Make sure that you cut the motor wires to the correct length for the Nighthawk X5 frame (or you can of course follow the guide for the X4 or X6). So before you cut anything, place the ESCs and motors of the arms of the quad, and work out what length they need to be. 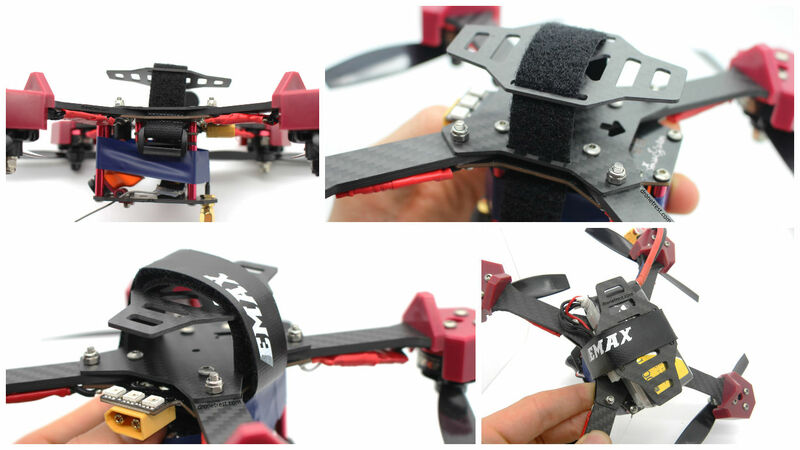 The Cicada ESCs in fact do not come with any motor wire soldered on which is good news – you just need to adjust the wires on the motors themselves. 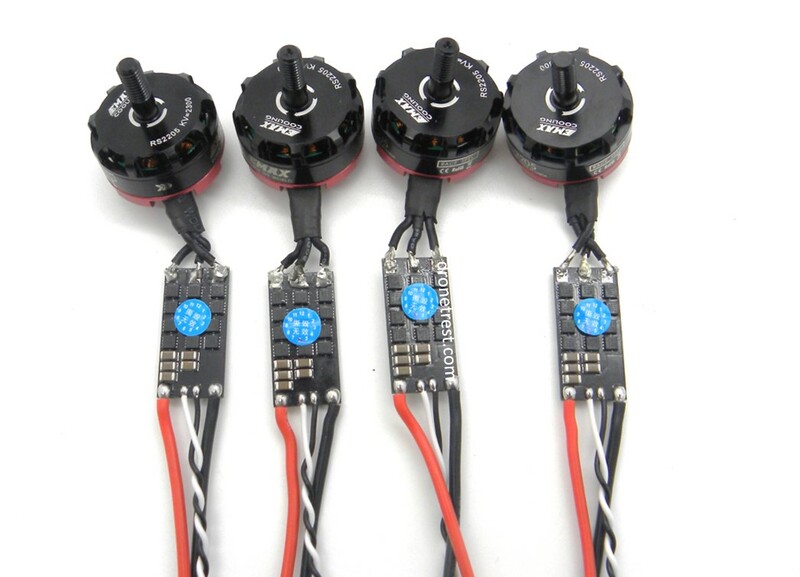 The motors are clearly labeled with which direction they are meant to spin – because the ESC’s we are using run BLheli firmware, it is very easy to change the direction of the motors if its wrong via the software (more on that in our configuration guide). If you are using other ESC’s in general the order of the wires dictate the motor spin direction (i.e. clockwise = wires not swapped, counter-clockwise = wires swapped). You can check that they spin the right way by following our guide. The motor direction can easily be swapped during software setup using the BLHeli suite and CleanFlight passthrough mode once the build is complete. 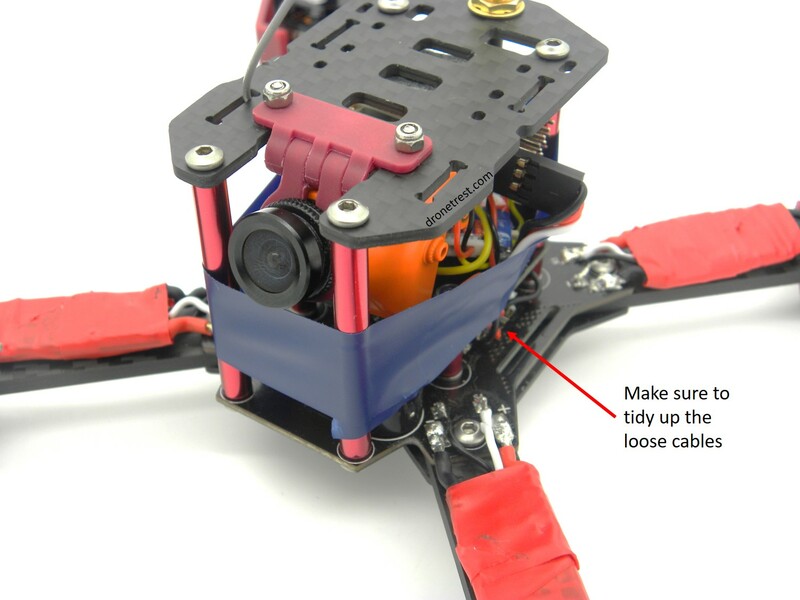 After this, you just need to adjust the lengths of the power cables on the ESCs for the frame, and cover the ESCs with either shrink wrap or electrical tape. We then secure the arms of the Nighthawk X5 to the power distribution board (PDB) and the bottom plate. There is a useful manual with the Nighthawk frame kit that shows you how to put everything together although I did go against it a little here. I put the screws into the frame from the top to the bottom (as you can see below). I think this looks neater and is more practical for the battery. We now first solder the ESCs to the PDB. We solder the power cables (red and black cables) to the + and – (bigger) solder pads and we solder the signal wires (black and white wires) to the two smaller solder pads. 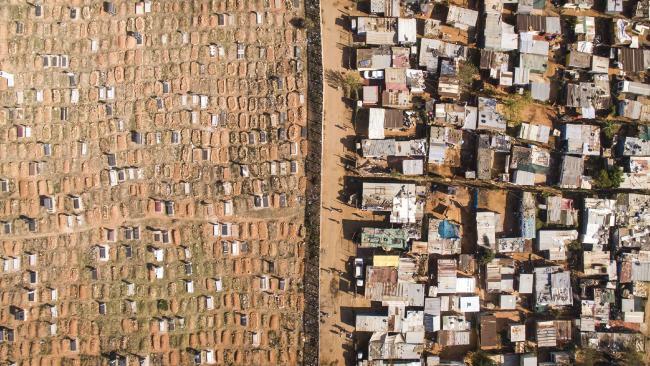 Ensure that the lengths of the cables are correct here. 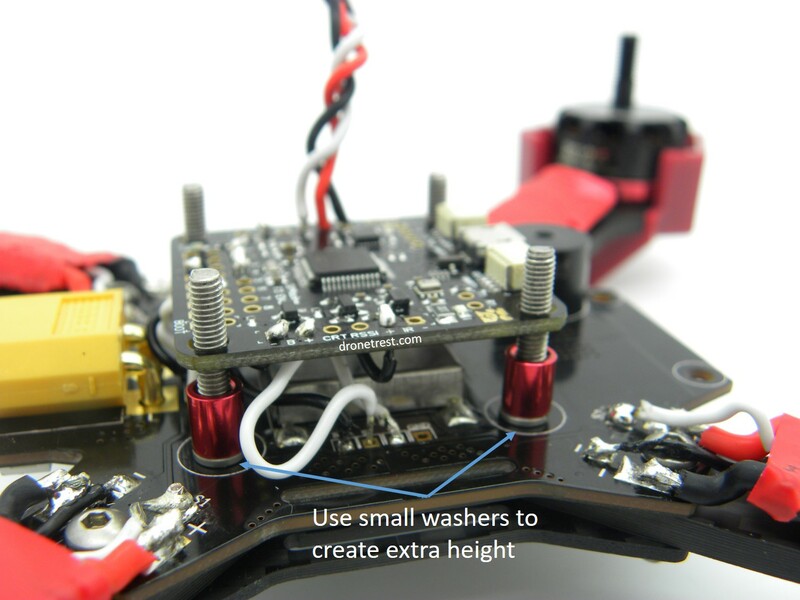 You need the power cables to be as short as possible so that the ESCs fit fairly comfortably on the arms. As for the signal wires, you can leave these slightly longer so you can manoeuvre them around the power cables. Do not discard the cut-offs from the signal wires, we will use these later. You also need to pay attention to which motor you are soldering to which arm. You need to connect the motors in the orientation outlined below. Once you have done this, you can secure the motors themselves onto the arms using screws and motor guards that are provided in the kit. 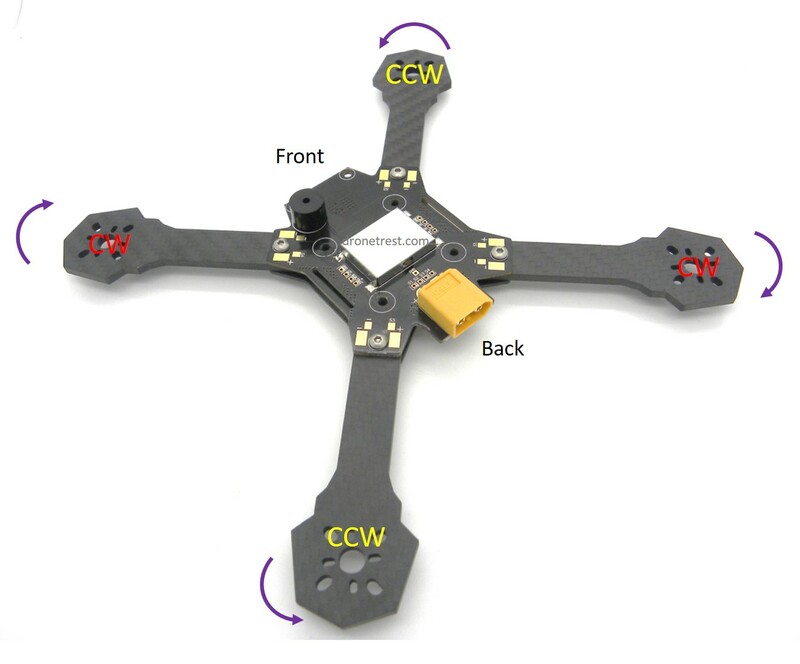 You will notice that there are little circular ports on the PDB and it is these that we will use to connect the flight controller – the wires go directly from the flight controller to the PDB. Below is a diagram outlining how to connect the flight controller to the PDB. It looks a bit complicated at first, but if you follow it slowly, it should make sense. The first thing to do is to connect a female servo cable to the flight controller. This can be seen on the left of the diagram and this is to connect the receiver to the flight controller. You first need to cut the servo wire down to size, strip the outer casing off the wires, insert the wires through the ports on the flight controller and then solder on the other side. We then move on to connecting the rest of the flight controller. 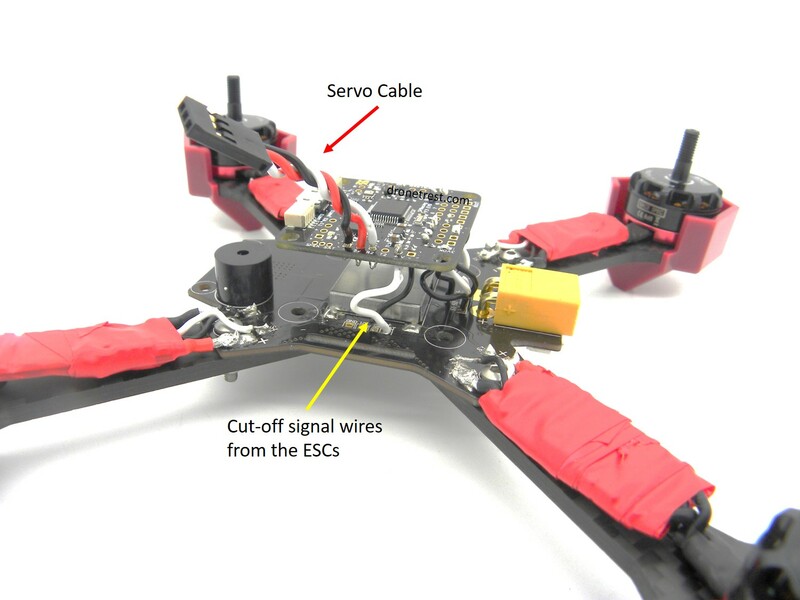 This is where we use the cut-offs from the signal wires from the ESCs as you can see. We connect these in the same way as the servo cable and so we insert the exposed wire through the port and solder. As we put the wires through the PDB, it is a good idea to undo the bottom plate (underneath the arms) as this means that we can access the wires on the underside of the PDB. We haven’t finished with the PDB board yet – we now have to solder the FPV cables onto it. Here, we’re using the Runcam Swift and the Dragonfly transmitter. We’ve connected them to the board as seen below. Here, I actually made the cables slightly too long, so feel free to make them a bit shorter to make for a cleaner build. We’ll actually connect the Runcam and transmitter later when we’ve completed more of the build. We have now finished soldering to the PDB and we can now re-attach the bottom plate underneath the arms. We can now attach the flight controller to the frame with the standoffs and screws provided. Again, you can follow the little manual that comes with the frame kit here to ensure that you use the correct screws and standoffs. As we were completing this step, we noticed that the SD card reader on the SP F3 Evo was touching the PDB and so preventing the flight controller laying flat on the spacers. We therefore created a little extra height on the spacers by using these washers. This stopped the PDB blocking the flight controller. And attach the other spacers for the utmost top plate (where is camera and radio receiver are mounted). 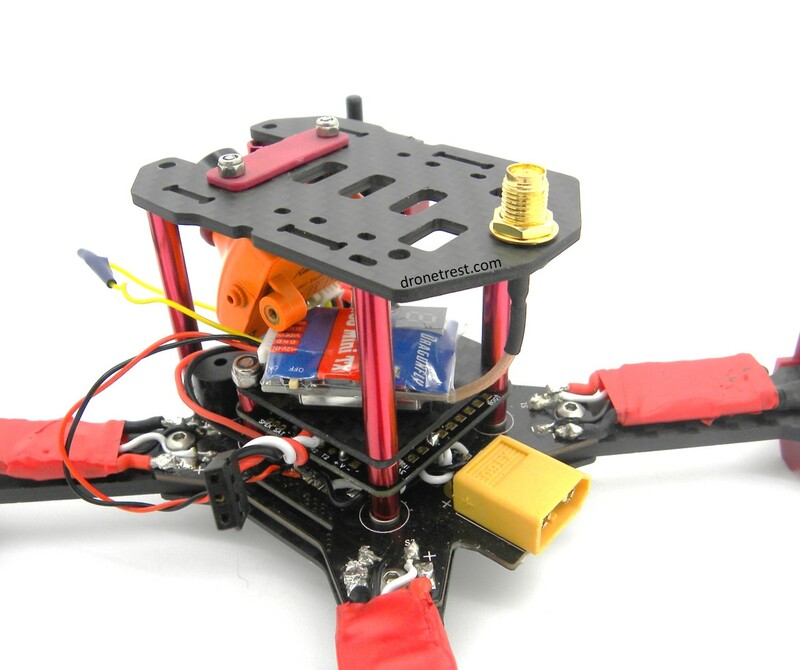 Before we attach the top plate to the frame, we will attach the Runcam to the top plate – makes sense right? 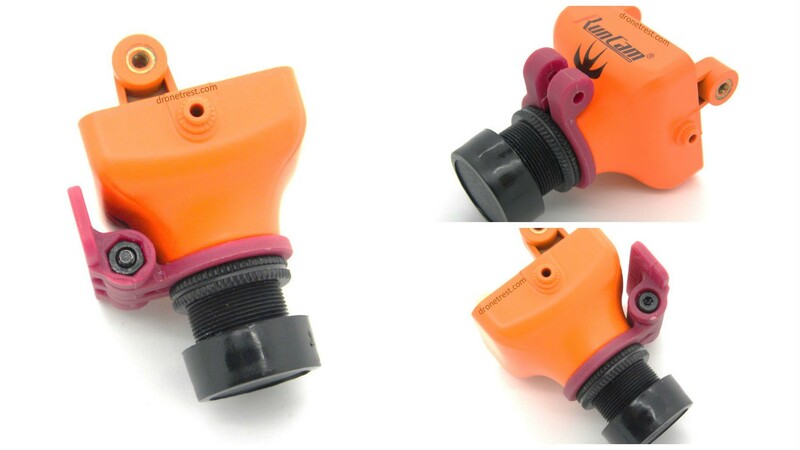 The frame kit comes with a handy, adjustable camera mount that just hangs from the top plate and so we just attach the Runcam to this, and the mount to the frame. We then screw the lens back in and attach the rest of the mount as shown. And then we simply attach the mount onto the underside of the top plate. We can now move on to the video transmitter. We’re simply going to stick this onto the plate above the flight controller but there are some things to look out for here. We need to position the transmitter so that we can access the on/off switch and the channel switch when the quad is fully assembled. We mounted it at a slightly kooky angle because this allowed us to thread the antenna plug through the designated hole in the top plate without overly bending the wire. We mounted it using some 3M mounting tape that was included in the frame kit and (as you can see) we connected the camera and transmitter with the modified cable. As a note, you may see that the cable is actually quite long – we’re going to tidy these up later – but you can always cut them shorter. We can then thread the antenna plug through the top plate and get on with mounting the radio receiver. The receiver is mounted on the underneath of the top plate as shown. Again, we used 3M mounting tape from the Nighthawk X5 frame kit and make sure to mount the receiver so that you can plug in the servo cable. You can thread the antenna of the receiver through one of the holes in the top plate to keep it out of the way of props etc. All we then need to do is to screw on the top plate once everything is attached . So we’re nearly there! We just need to attach the antenna for the transmitter, attach the props and attach the battery. We just pop the antenna on (as you would expect) and here we are using the Triumph Antenna from Team Black Sheep as they are pretty awesome and give you great performance. Before we move on to attaching the props, we have to make sure that all loose cables are tucked away safely. Alternatively, you could sandwich them under the transmitter. All we have done is tuck them inside the main body of the quad and encircled the body with electrical tape to stop them escaping during flight. But this makes it abit awkward to access the video transmitter, or the USB port on the SPF3 Evo flight controller. We can then move on to the props. 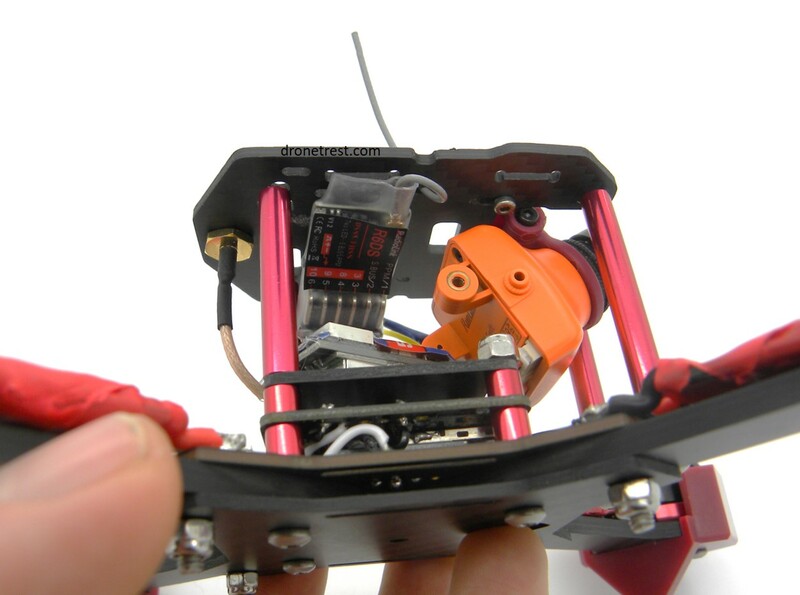 Make sure to attach the correct prop to the correct motor (as each prop is designed to spin in a certain direction). You need to attach a prop that spins clockwise to the clockwise rotating motor and the same applies for the counter-clockwise rotating motor. This may be quite obvious but it’s always good to say it explicitly I find. At this point, don’t worry too much about tightening the props too much as we will need to take them off later when we configure the SP F3 Evo flight controller via CleanFlight. Each motor comes with either a black prop nut (for clockwise spinning motors) or a silver nut (for counter-clockwise). Make sure you use the correct nut. We used 5×45 ABS Bullnose Propellers which require no prop adapters and fit nicely on the motors. You then screw the prop nut on by hand until you can no longer do so. At this point you have to tighten the nuts with some tools. We found that the easiest way of doing this was with two talon wrenches from Emax. Make sure the nuts are snug against the props and we’ve attached the props! All that’s left to do now is to add the battery. The Nighthawk X frames come with a ‘floating’ plate for the battery and we just hook this up with the velcro strap that is included with the frame. We’ve tucked the JST connector inside the velcro strap as we don’t want this getting in the way and you can always secure the battery further by adding some sticky-backed velcro to the top of the battery. And there we have it! All built and ready to configure the SP Racing F3 Evo flight controller. So that’s the end of Part 1 of the build guide. You can now move onto Part 2 for the configuration of the SP Racing F3 Evo Flight Controller (among other things).